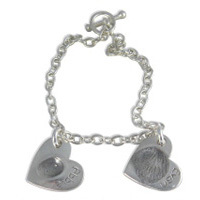 This price is for two classic bracelet charms attached to a fine 7.5 inch T-Bar and ring sterling silver classic bracelet. This price is for two classic bracelet charms attached to a fine 7.5 inch T-Bar and ring sterling silver classic bracelet. The charms can hold a print and name and weighs a maximum of 4g of silver each.